It’s understandable why Sarah Krupp calls her family’s home a zoo. Their inventory of pets includes three dogs, two cats, two chickens, two tortoises, a turtle, a giant saltwater fish tank and a rat. There have also been frogs, guinea pigs and lots of birds. Surrounded by creatures her entire life, Krupp knew her future career would involve working with animals. She found the academic setting that compliments her lifelong affection for animals at Windward Community College’s Veterinary Studies Program. Windward’s certificate of achievement in veterinary assisting is designed to provide students with basic knowledge and skills to work as an assistant in a veterinarian’s office, animal shelter or animal research facility. The two-semester program started in fall 2009. In addition to science classes and a mathematics course, the curriculum includes an internship and even a speech and psychology class to prepare students to communicate effectively with pet owners. There was no veterinary technician program offered in the state when local veterinarians approached Windward about offering such a program. Windward biology instructor Ross Langston began assembling appropriate classes. He is now the program coordinator. Krupp has applied the academic lessons in her internship with an area veterinarian. She applies science training when she does blood work on animals. The speech and psychology class helps her deal with pet owners who may be distraught over their pets’ illnesses. And while the welfare of animals remains the primary focal point, she has also learned that a clinic is a business, and must be operated like one. “It’s definitely shown me a lot,” Krupp says of her internship—including animals that aren’t as well taken care of as she’s used to. Hawaiʻi has no veterinary schools, postgraduate education that prepares students to become veterinarians much as medical schools prepare students to become doctors. The University of Hawaiʻi at Mānoa College of Tropical Agriculture and Human Resources offers an undergraduate pre-veterinary program, and UH Hilo offers an animal science–pre-veterinary medicine specialization. Langston expected to start one cohort of students each year. Due to program demand, a new cohort begins each fall and spring semester. Classes fill up fast. Local veterinarians help teach—Sam Craddock is the veterinarian technician instructor, Jan Chouljian is the veterinarian instructor. As veterinary assistants, the Windward graduates help veterinarians conduct physical exams, run laboratory tests, draw blood samples, admit patients and complete medical records. Langston hopes the current program will be a stepping-stone to a two-year associate of science in veterinary technology degree program. Technicians do the work of assistants as well as assisting in surgical procedures, anesthesiology, radiology and dental cleaning. Most states require technicians to pass an exam for licensure or certification. Since Hawaiʻi does not have a veterinarian technician program and licensing program, veterinary assistants are often asked to fill the roles of technicians. Under an articulation agreement with San Juan College in New Mexico, Windward students can transfer credits and complete the rest of San Juan’s veterinarian technician requirements through online coursework and an internship at a local clinic. The community college classes and pre-veterinary coursework at UH Mānoa and UH Hilo also help students who are considering a career as a veterinarian. Although not a degree program, Mānoa’s coursework prepares students for admission to veterinarian schools elsewhere. Students receive advising throughout the program, and there is a pre-vet club for students. “Students come from all different backgrounds,” Stokes says. Their interest isn’t limited to typical household pets. Given Hawaiʻi’s long ranching history and Pacific location, she also sees students who want to work with agricultural animals or marine life. Others are interested in zoo animals. Hawaiʻi veterinarians even traveled to Japan to assist in animal rescue and care following the March 2011 earthquake and tsunami. 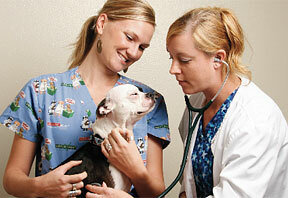 For those who decide to continue their studies, there are 28 veterinary schools across the United States. Hawaiʻi students can attend universities in the 14 western states participating in the Western Interstate Commission for Higher Education, which allows them to pay in-state tuition. “It’s an amazing profession because it blends science, medicine, working with people, working with animals,” Stokes says. View the Mālamalama video about UH alumni who tend penguins in Waikīkī. I would love to see a program such as this at UH Manoa. I realize the UH cannot be all things to all people, but this would keep many of our students in Hawai`i and bring many to study in Hawai’i. The paradigm for owning pets has shifted greately in one generation alone; from primarily utilitarian to beloved members of the family. Research suppports the healing properties of pets (they are now regular visitors in nursing homes and hospitals and are increaslingly used to augment therapy for PTSD and other related behavioral mental health disorders). Pets also offer an opportunity to teach our young how to treat other human beings. I believe this would be well-received if offered in Hawai`i.